Fooding-The art of creating food. I used to make something similar in college, though not by a recipe. Here’s another quick, filling and satisfying Superbowl party snack. While still steaming hot, stir in the cheese, sour cream, peppers and chilies in a large mixing bowl. 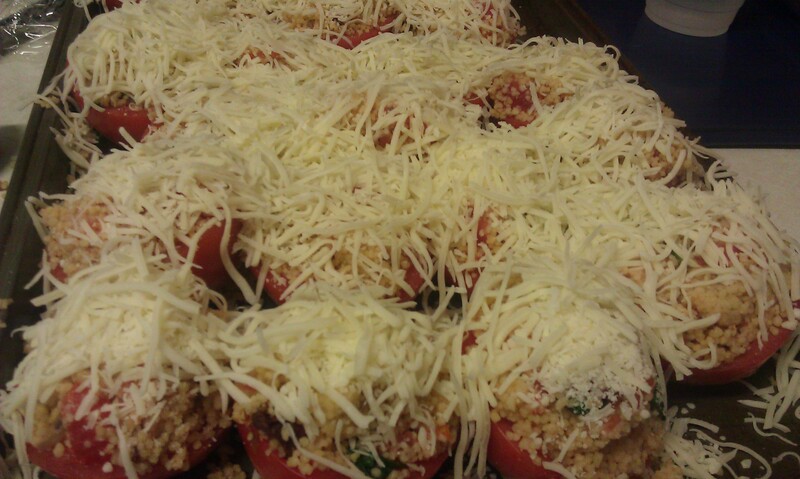 Cook in the oven at 350 degrees Fahrenheit for 15-20 minutes to melt the remaining cheese and heat the sour cream base. 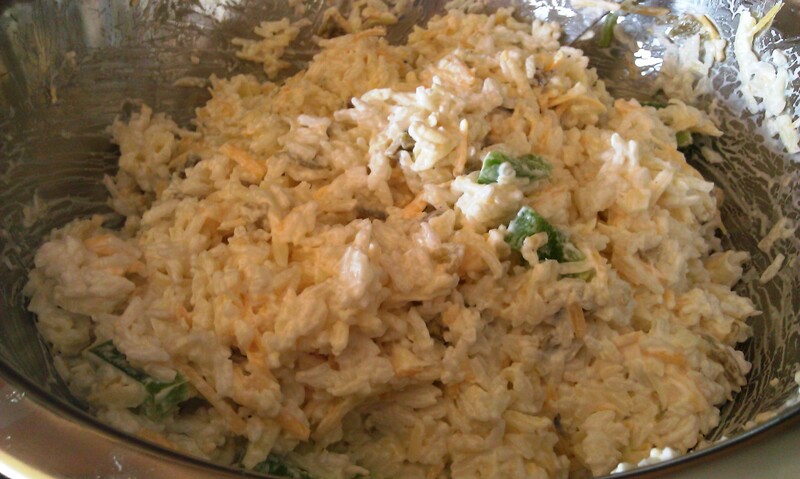 If you like a crunchier topping, place the rice in the broiler with an additional sprinkling of 1/4 cup of cheese for 5-10 minutes until the top is golden brown. Place in a serving dish that will keep the rice piping hot and serve. Like I said, this is quick and simple. 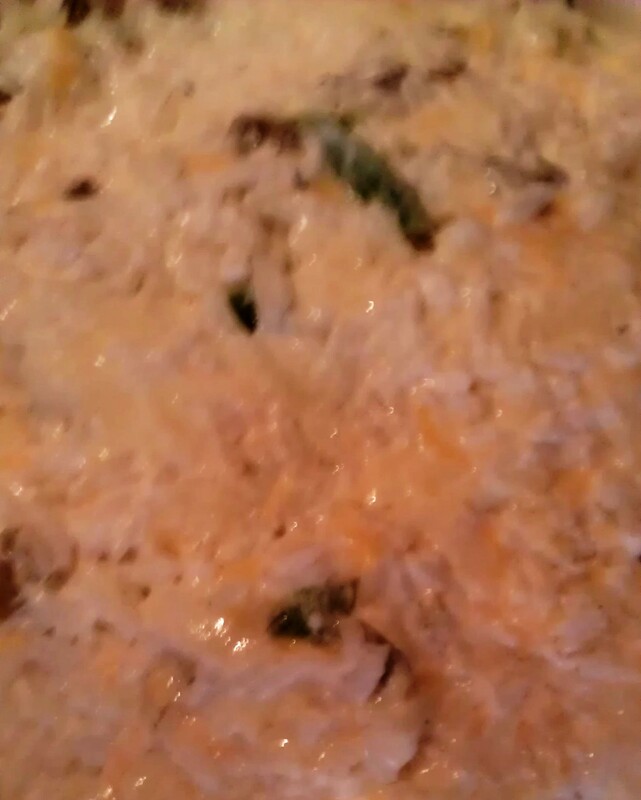 The sour cream and cheese meld together to give the rice a creamy, cool base. The chilies and green peppers add a bitter, spicy bite to the bland rice. If you like things spicier, toss in a jalapeno or habanero. This would also taste good with green or black olives. It’s perfect for the vegetarian in the group. For Christmas, I was going to make the kids in my life crayons out of the letters of their names. I purchased what I thought was an oven-ready mold, but when it arrived it was a tiny, plastic, chocolate mold. My mistake, but rather than resell it I thought I would utilize the chocolate mold by making alphabet suckers in primary colors for Tommy’s 1st birthday party. 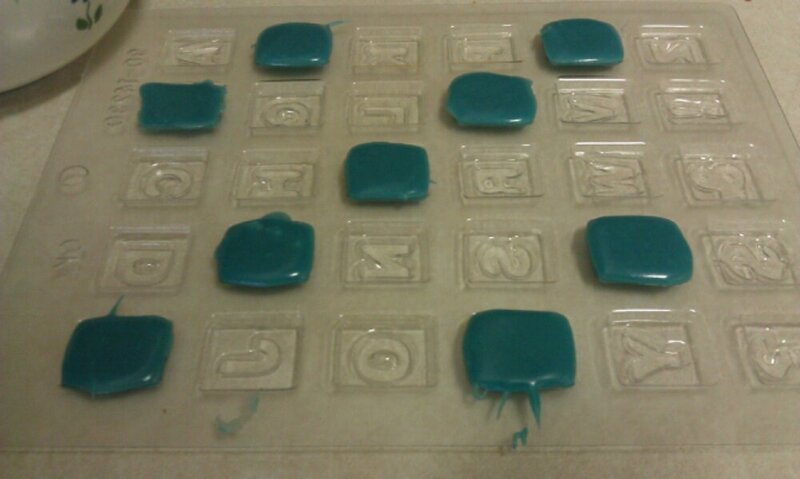 After a series of unfortunate events, such as me forgetting to spray the mold before placing what turned out to be too soft of chocolate in, I pushed my hand through the plastic breaking the alphabet into an uneven half. (Don’t worry, I’ll spare you the bloody picture). But, I was still able to utilize the yellow melted chocolate on top of the cupcake frosting. Start by making the cake. Preheat the oven to 350 degrees Fahrenheit. 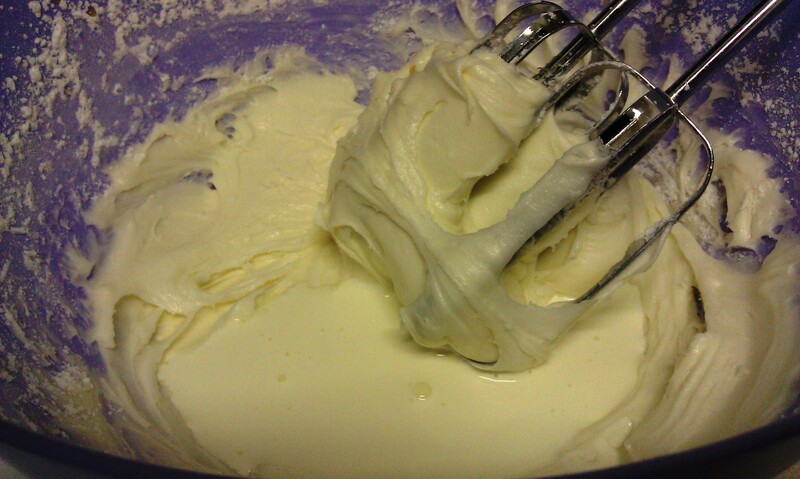 In a mixing bowl, blend together cake mix, almond extract, oil, water, and eggs using an electric hand mixer. Whirl around until smooth, approximately 2 minutes. 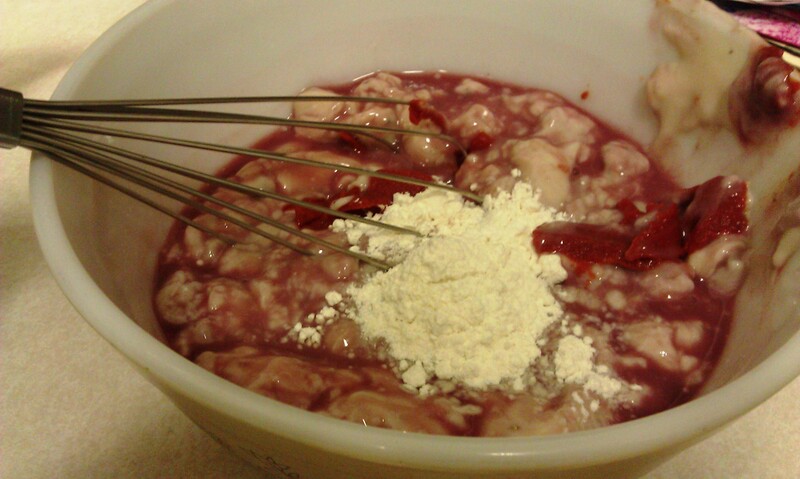 Add in the chocolate chips and fold over with a spoon until they are well dispersed into the batter. I chose to make mini cupcakes with mini, white paper cups. If you are cooking these for yourself, you can eliminate the paper cups by spraying or Criscoing the muffin tin. Fill each cup about 3/4 from the top. They will rise in the oven. Place the pan in the oven and cook for 15-20 minutes. To check if they are ready, simply stick a wooden toothpick in the center of a cupcake. If it comes out clean, they are done. If it has batter on it, they need more time in the oven. In the meantime, you can start the frosting. With a clean electric hand mixer and bowl, combine together the cream cheese, lemon juice, whole milk, vanilla, butter and 1/2 cup of the powdered sugar. 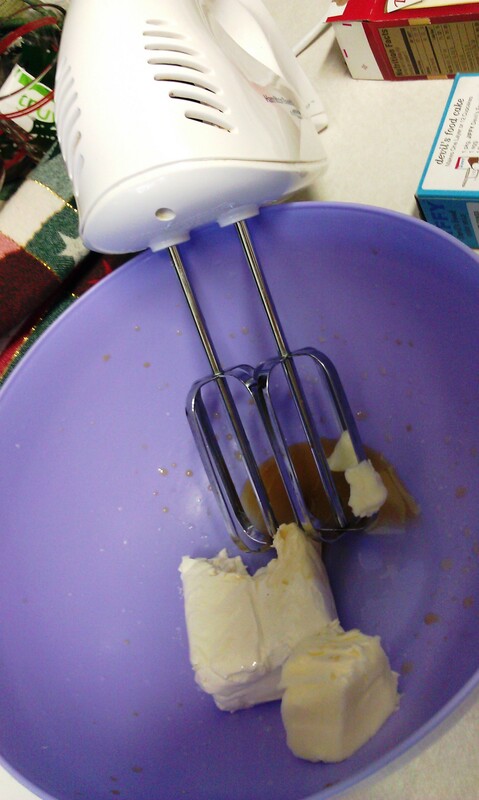 Blend on medium speed until smooth, approximately 3-5 minutes, slowly adding in more powdered sugar, section by section, until you’ve used 1 1/2 cups (more if you like it a little stiffer for accurate piping, less if you like your frosting on the soft side). Finally, add in your favorite food coloring color (or multiple to make such colors as purple or orange). I chose blue, using maybe 20 drops for a deeper hue. Now is a good time to make the chocolate letters. To make a double boiler, simply add in an inch of water to a large pan. Bring the water to a boil and place a smaller pan filled with your chocolate ingredients on the inside. Again, pick your favorite color to dye the white chocolate chips. 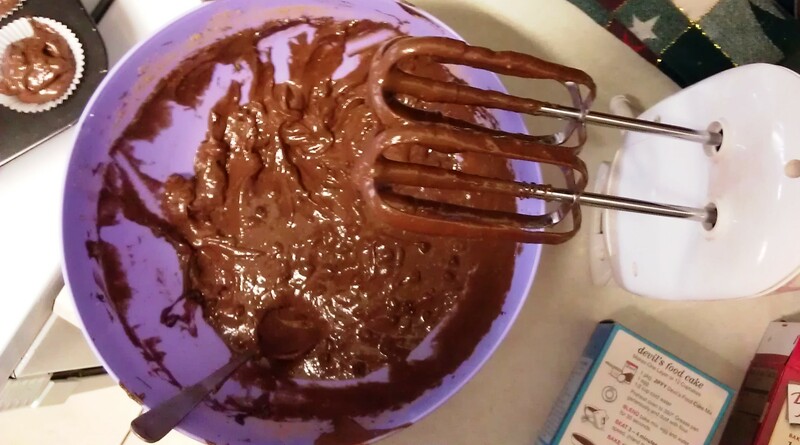 Stir constantly, until the chocolate is melted enough to spread. This method is a fool-proof way of not burning the chocolate. On parchment paper, create your letters by hand using a toothpick or small spoon. Stick the parchment paper into the freezer for 10-15 minutes. When your cupcakes are cool, frost them using a spoon, piping bag, or, like me, a cookie press that also serves as a frosting gun. Pull the chocolate letters out and immediately peel them from the paper. If you take too long, stick them back in the freezer for 5 minutes and finish the remaining letters then stick them into your frosted cupcakes. 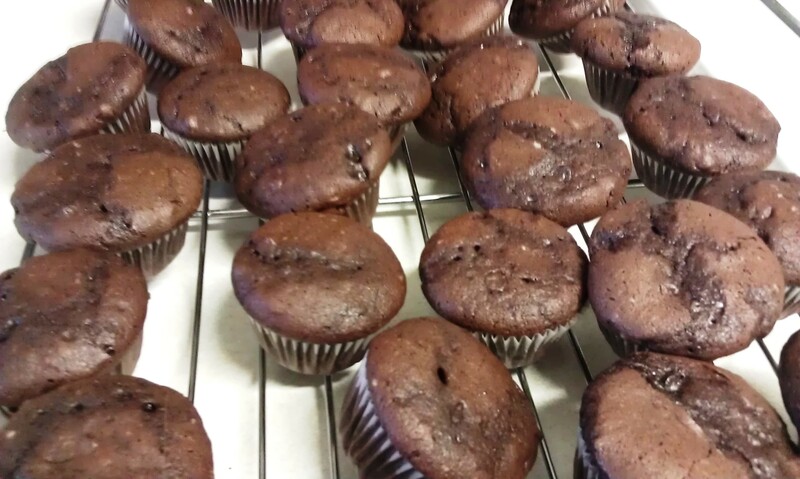 Though my friend was excited for chocolate suckers, as someone else also brought cupcakes to the party, these minis were delicious and easy to pop in your mouth without feeling guilty after a high-fat, filling dinner of Portillo’s Beef Sandwiches. I personally enjoy minis because they not only look cute; you feel you can eat more because of the size. This isn’t necessarily true, but comforting during the process. 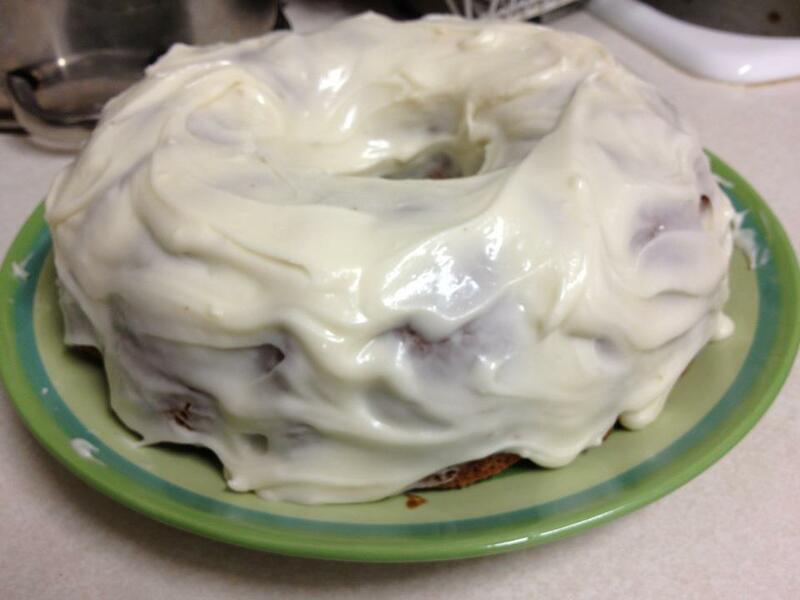 The addition of lemon and vanilla into the cream cheese frosting was my personal favorite. It was subtle, not overwhelming, but noticeably different in comparison to previous cream cheese frosting recipes. 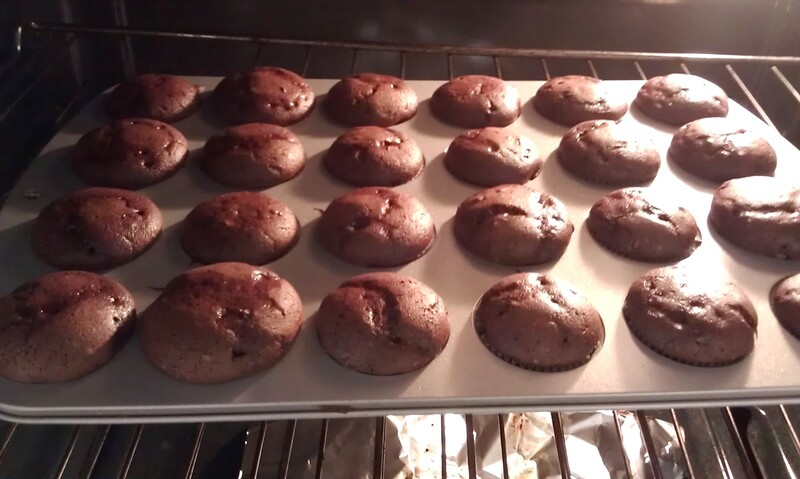 The almond extract in the chocolate was almost invisible, so feel free to add in another teaspoon, but the chocolate chips definitely initiated a heavier cupcake. 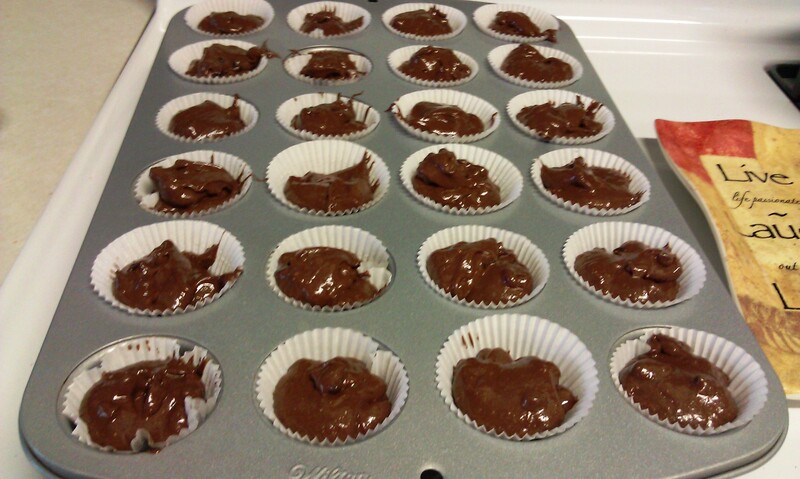 They melted leaving little pockets of condensed, smooth chocolate. 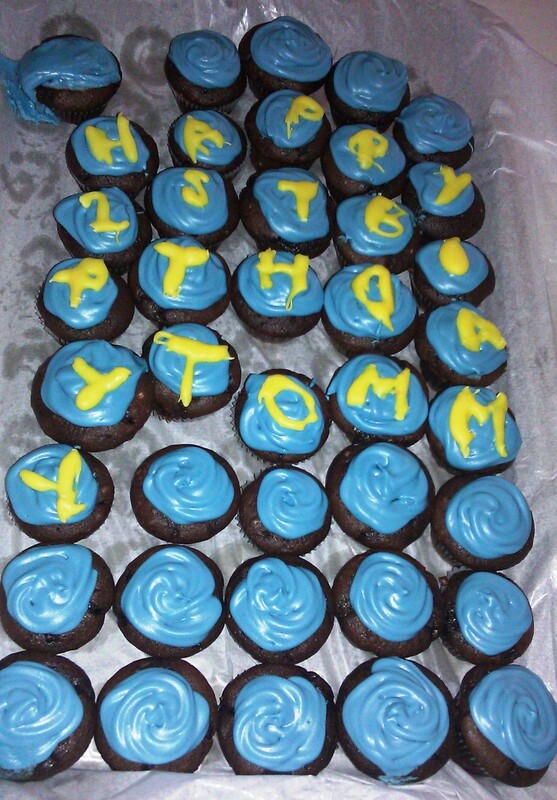 Finally, the chocolate letters were a fun addition, clearly stating the purpose of the cupcakes (“Happy 1st Birthday Tommy”), that people could take off and eat. Next time I will arrange to take more time on this part so each letter is consistent and easy to read. Can I have a car air freshener in Shepherd’s Pie?? 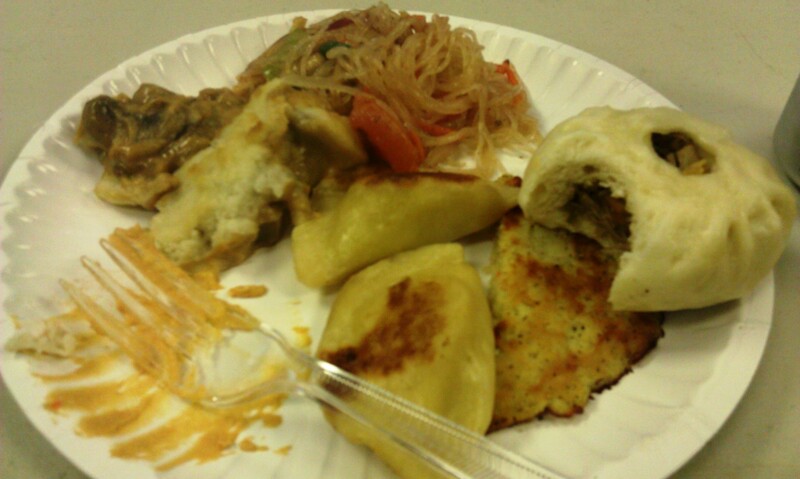 For Shirley’s birthday, my boss decided we’d all make an ethnic food and share during lunch. There was everything from Thai food to Polish to my Irish Sheppard’s Pie (mutilated, as Brandon says, because I made it vegetarian and it is usually rich with meat). With a whisk, whip together the cream of mushroom soup, your choice of dry red wine (I used a cheap brand, but the addition of wine really perked up the adult taste buds), tomato paste and flour. When the liquid is creamy and smooth, set aside for some time to let the flavors meld. 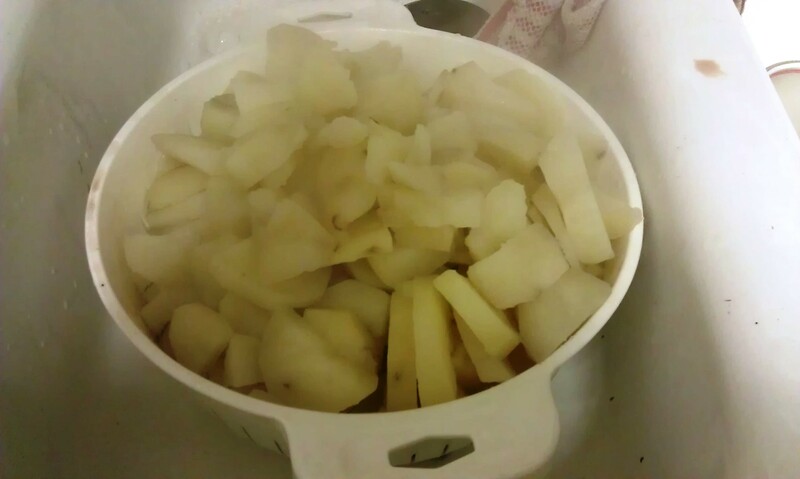 Chop up your potatoes and place in a large, covered, boiling pot of water. Cook until they almost fall of a fork when poked, about 20-30 minutes. In a frying pan, melt a tablespoon of butter. Add in a handful of mushrooms (don’t overcrowd them, just enough to evenly cover the bottom of the pan) and cook over medium-high heat until the mushrooms are browned on both sides. 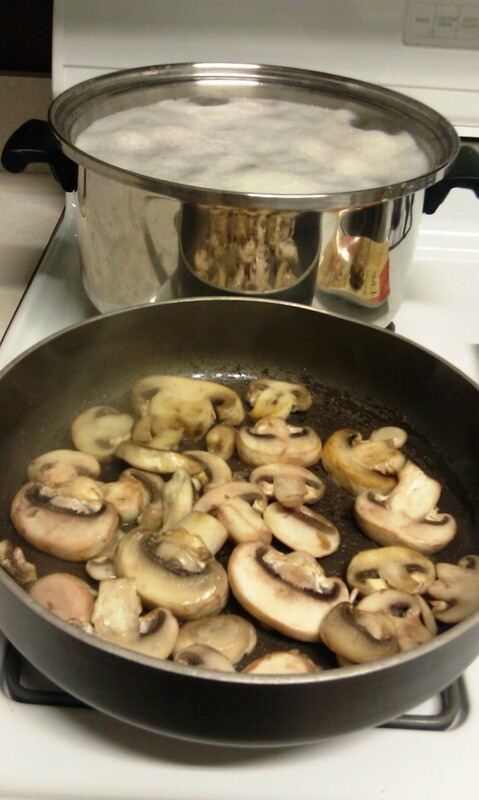 Place in a separate bowl, and then repeat until all of the mushrooms are completely browned. 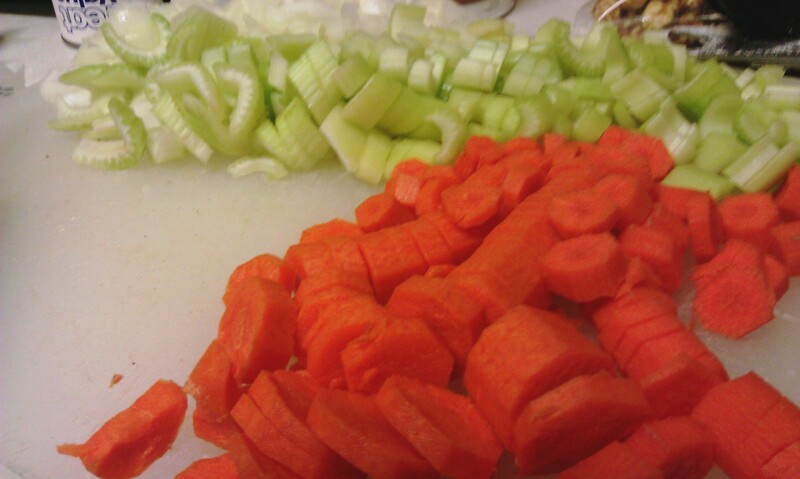 Melt another tablespoon of butter in the now empty pan and toss in your onion, celery, garlic, carrots and seasonings. Cook until the vegetables are soft and the onions become translucent, about 6-8 minutes. Add the wine, mushroom broth mix to the pan making sure to scrape the sides of the pan and bottom to keep from burning. Simmer for 3 minutes. 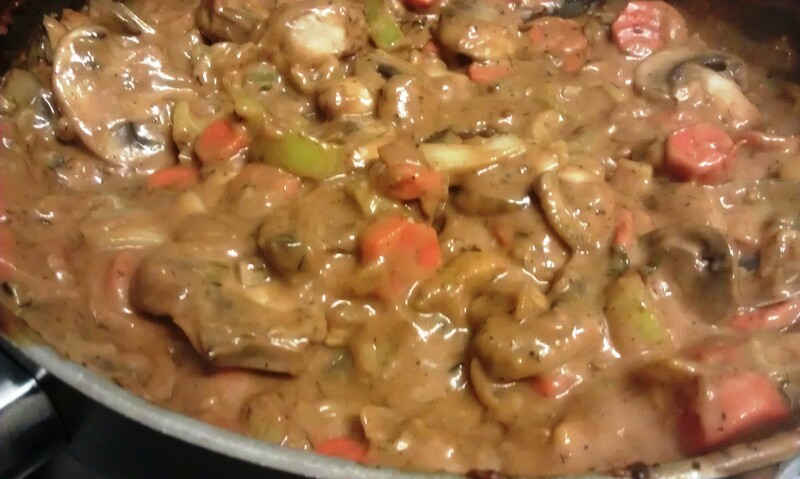 Plop in the mushrooms and cook at a simmering stage until thick and darker maroon in color, approximately 8 minutes. Strain the liquid from the potatoes and return to the pot. 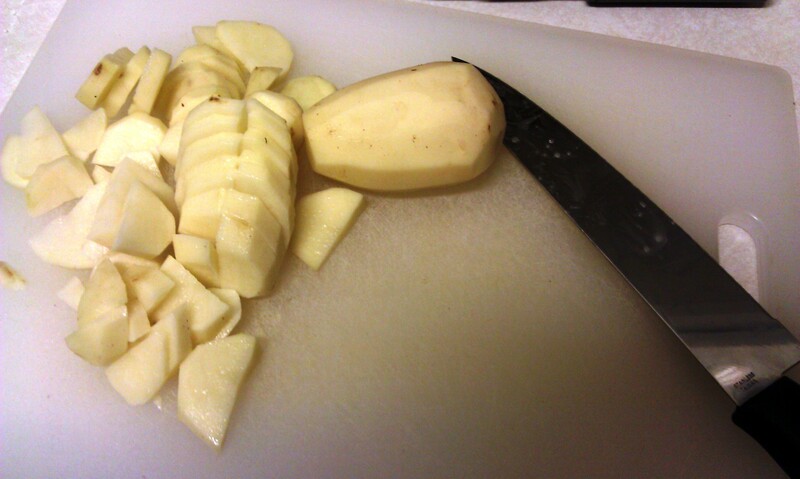 Mash together the potato chunks, 2 Tbsp. 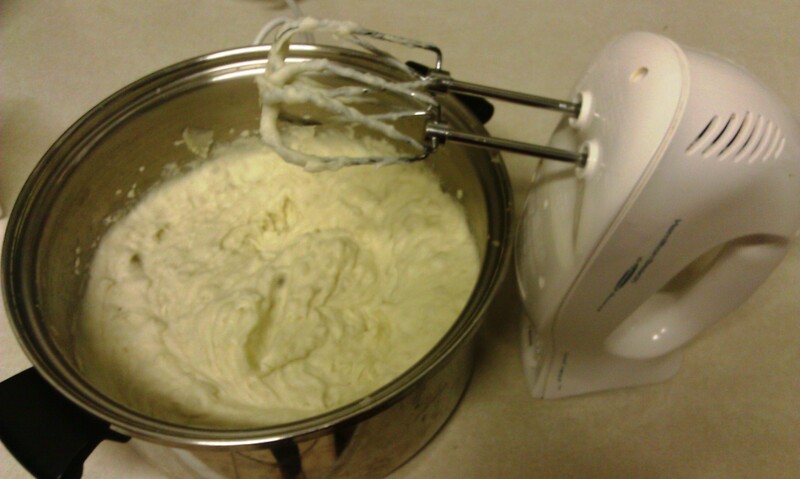 butter and cream with an electric hand mixer for about 5 minutes or until smooth and whipped. Season with salt and pepper. 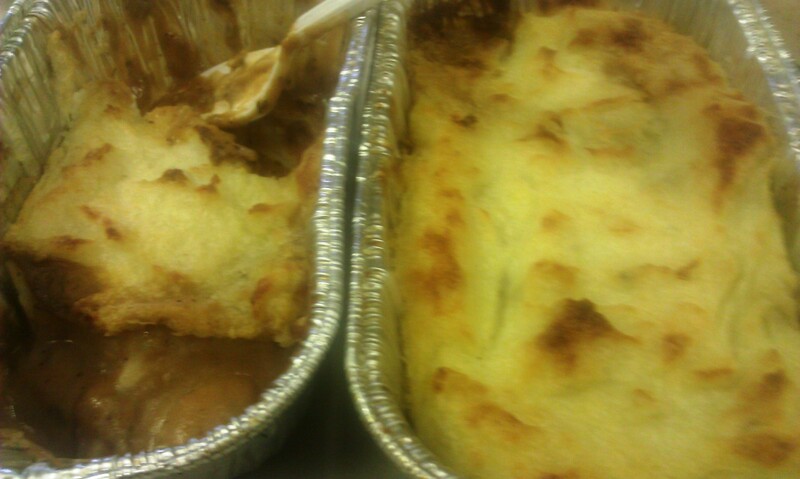 In a pie dish, 9″ x 9″ baking dish or mini bread loaf pans, spread the vegetable mixture over the bottom. 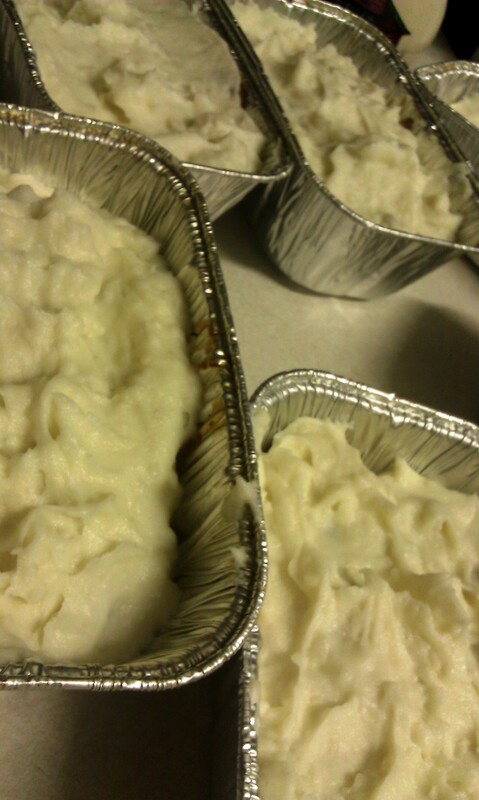 On top, dot the potatoes all the way across to the edges. Take your fork and sporadically dip in and out of the top of the potatoes to create little peaks and valleys. These will become a crunchy texture in the oven. Bake at 350 degrees Fahrenheit for 20-30 minutes. 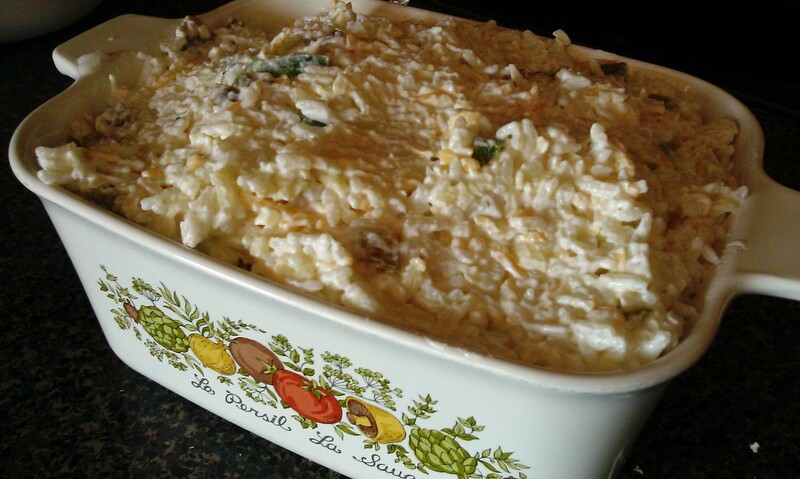 The vegetable mixture may bubble, breaking the potatoes away from the sides. If you like the top more crunchy and browned, turn on the broiler and heat for 5 more minutes. 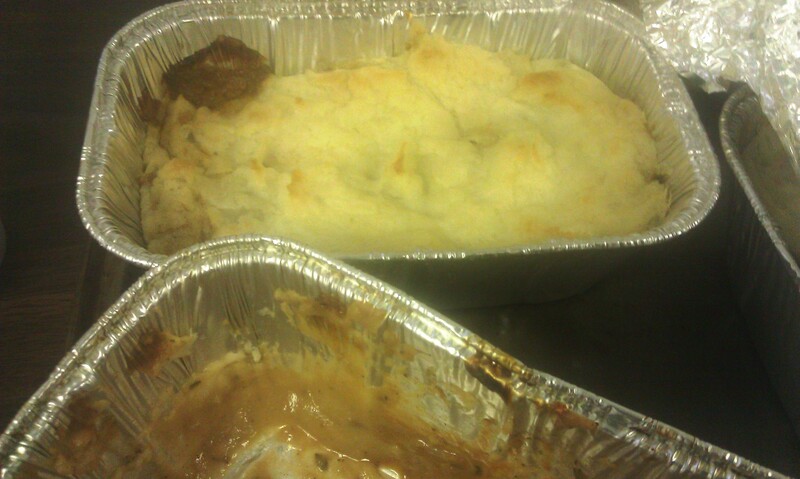 I chose to cook this in disposable mini bread tins for the sole purpose of reheating them at lunch in the toaster oven. They fit perfectly. 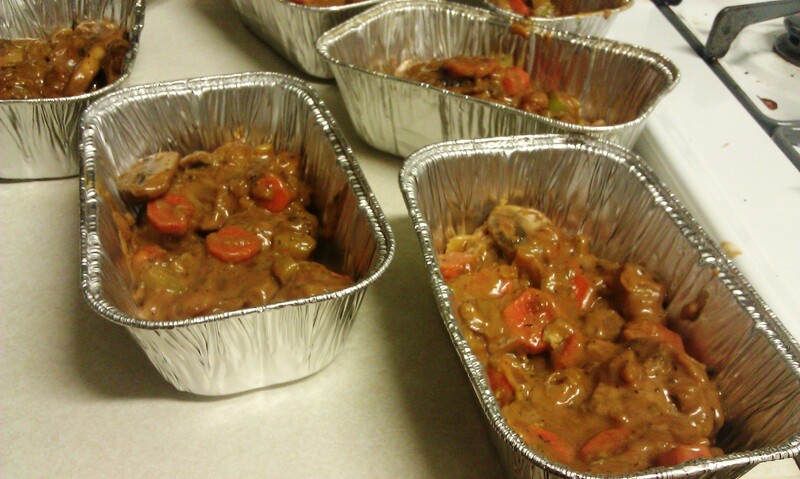 I tossed them in the oven to cook before leaving for work and by lunch, they only needed about 5 minutes of reheating. I drove all the way to work (just under an hour) to work smelling this deliciousness and somehow managed to dispel the urge to pop open a pie and dig in. 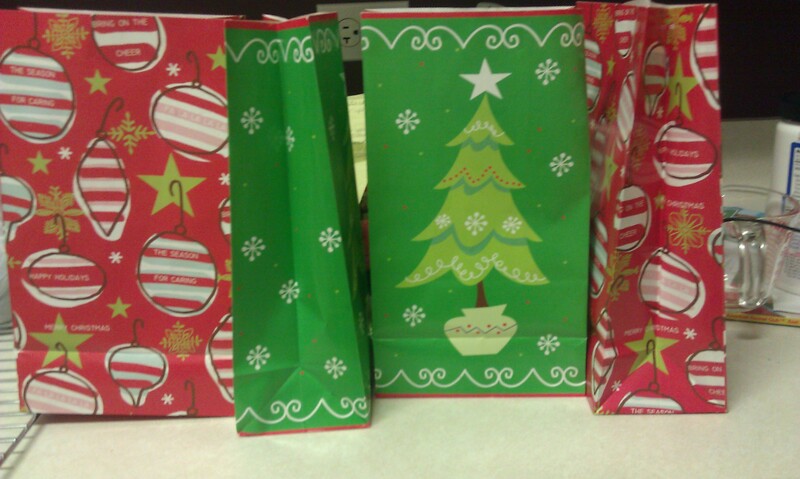 The mix made about 7 minis: one for my mom, two and a half for lunch, and three for people to take home. Just the smell was enough to make someone do a happy dance. The mushrooms (could have been chopped smaller) mixed with cream of mushroom soup helped to make a hearty, thick vegetarian version of this hodgepodge of a dish. The potatoes fill your stomach right up, as Irish food is known for, and the butter and cream helped to flavor the bland starch some. I used Lucky Duck Shiraz, a cheap wine, but it supplied the distinct, incomparable oomph necessary to make a meat dish turned vegetarian work. The potatoes just melt in your mouth, and dissipate some of the saltiness of the cream of mushroom soup. When in need of an extra vegetable that can sub as a main meal for the vegetarian coming to your party, reference back to this recipe. I made these for Christmas and was in no way missing out during dinner. 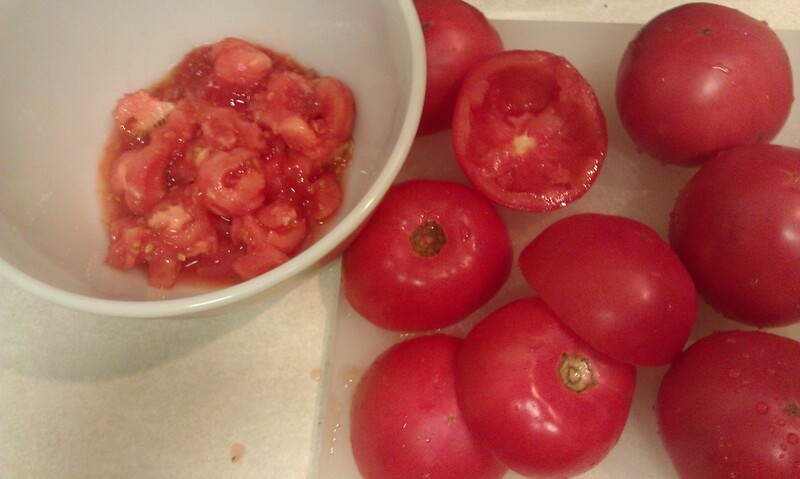 Wash the tomatoes then start by cutting the tomatoes in half and spooning the center out into a bowl. I used a melon baller, which worked perfectly for this task. Set aside for later. 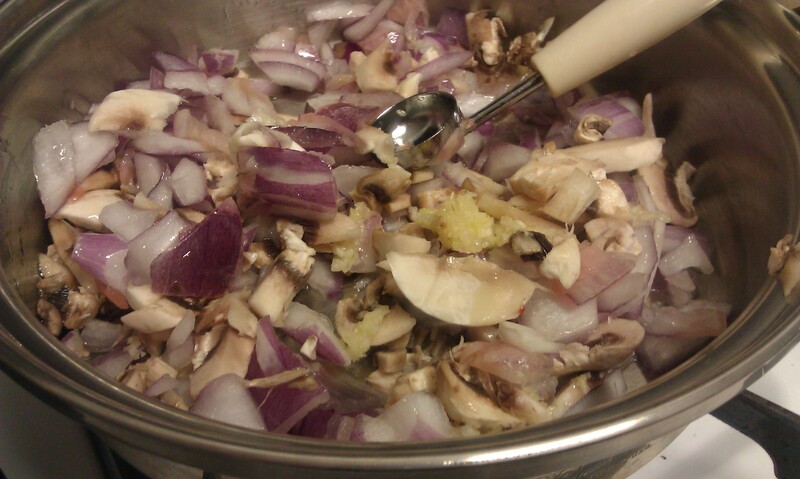 Next, fry the onions, mushrooms and garlic together with a tablespoon or so of olive oil in a frying pan. Cook until the mushroom turn dark brown in color and the onions become translucent, about 5-8 minutes. Everything should smell of garlic. 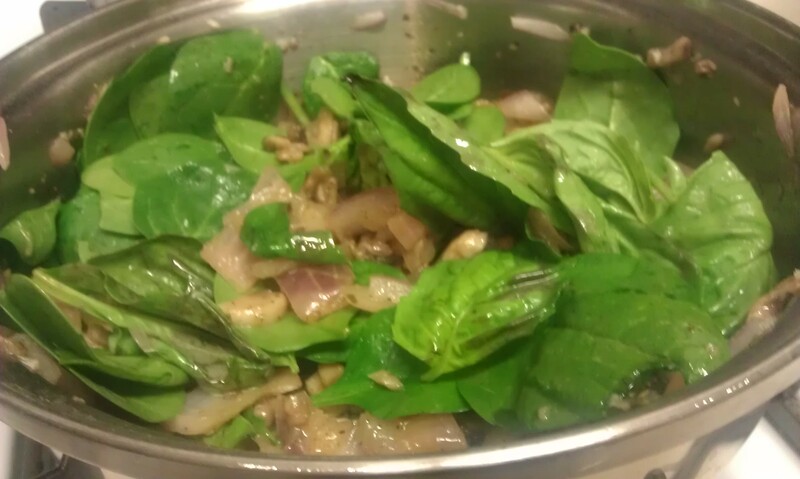 Toss in your greens and spices (spinach, basil, pepper, cayenne, Italian seasoning) next then cook until the basil shrinks, about 2-4 minutes. 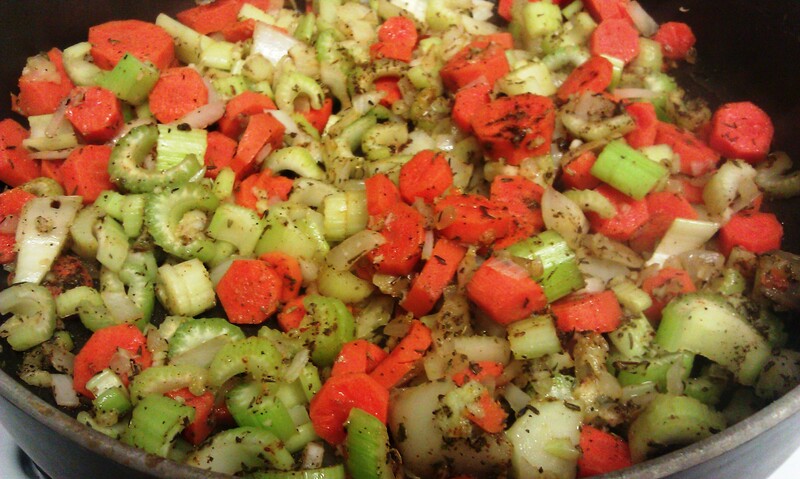 While your vegetables are cooking you can start the couscous. Cook according to the directions replacing the water with vegetable broth. 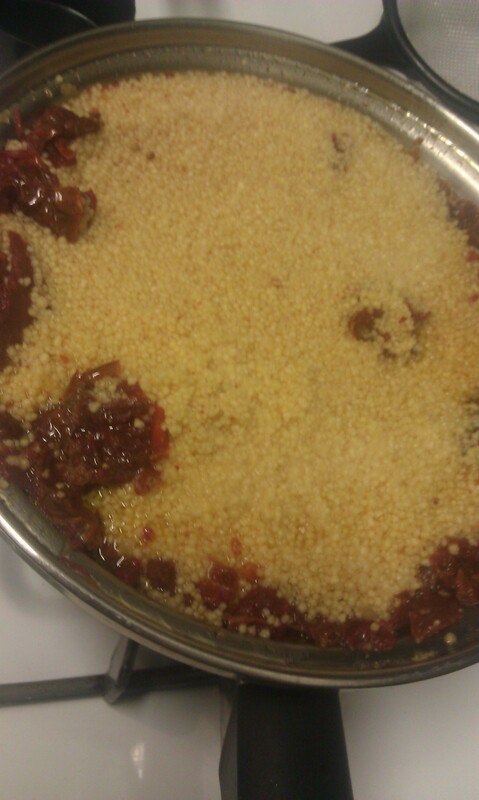 When the couscous is almost complete, stir in the sun-dried tomatoes until thoroughly heated (I used canned sun-dried tomatoes that were already softened). When I made this I used two boxes of couscous because I doubled up on the amount of tomatoes, but this is not necessary. One box was plenty and the condensed vegetable medley would have provided more flavors. Next mix together your vegetables, couscous and tomato pulp in a mixing bowl. 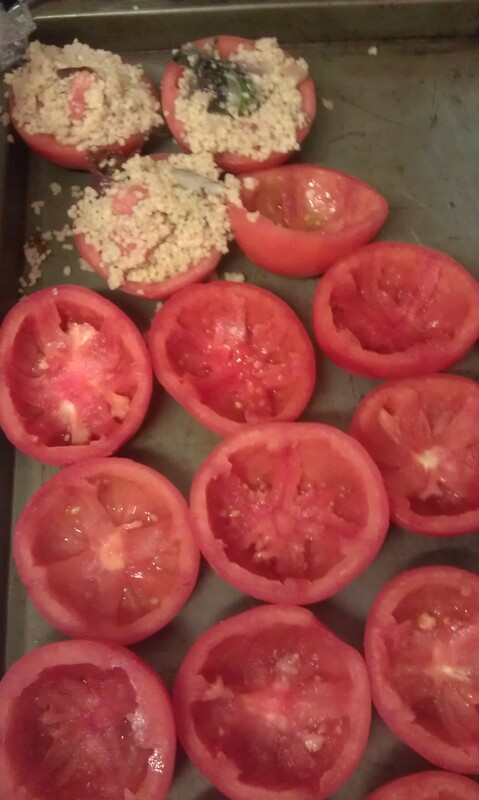 Stuff the couscous blend into the tomato halves and place on a roasting pan. 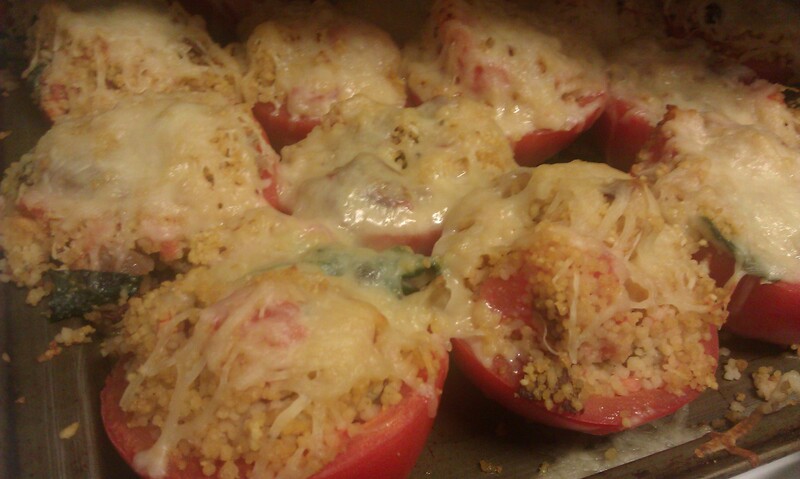 Top each tomato shell with a healthy amount of cheese. Here you can experiment using parmesan, mozzarella, white cheddar or even fresh mozzarella slices. Another tasty option would be to mix parmesan inside the couscous mix and top with mozzarella. Bake in the oven at 375 degrees Fahrenheit for 25-30 minutes. To brown the top, broil for 3-5 minutes. This was an excellent main course for Christmas for the vegetarian in our small group (me). My uncle stated that when he spooned in a piece of basil with his grains it made a huge difference in adding much-needed flavor to the boring couscous. 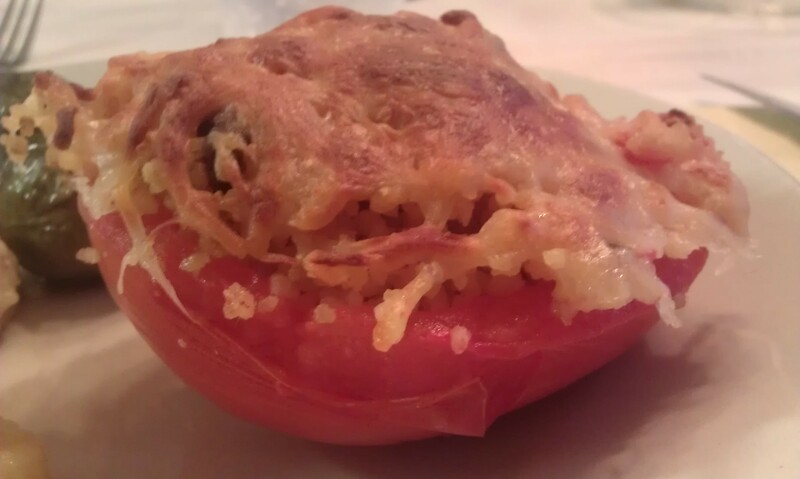 The tomatoes mush, somewhat, when cooked allowing your fork to slice right through scooping up bits of grains, cheese, vegetables and tomato. 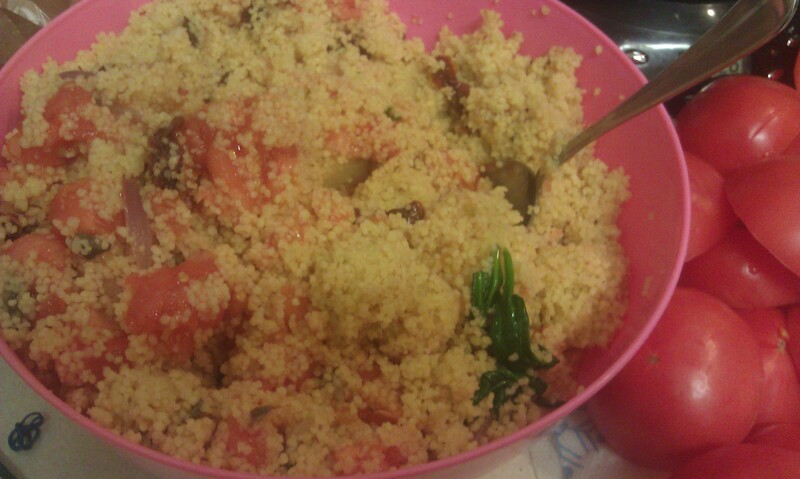 I took both the left over couscous medley, tasty just on its own, and whole tomatoes to lunch for the next week. Two was more than enough to keep me going until dinner. The couscous, similar to when you cook it, puffs up in your stomach keeping you full for quite a while with a healthy carbohydrate. To make this gluten-free simply substitute in quinoa for the couscous. 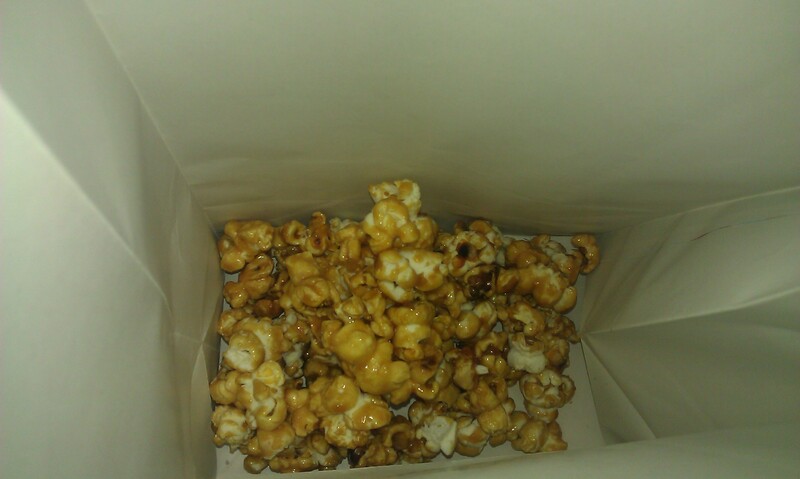 Like Garrett’s popcorn, I went for a salty sweet mix with my popcorn, combining the cheese and carmel. 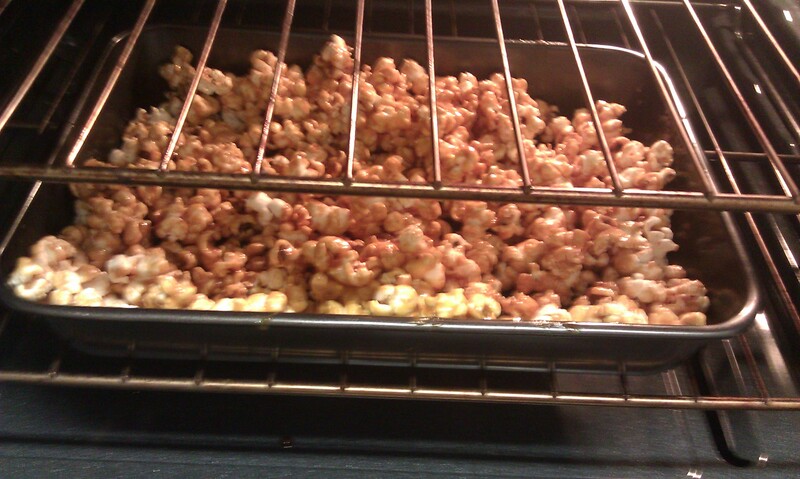 Carmel corn turned out to be a bit more of a challenge than the cheese, but much tastier. Start by melting the coconut oil in a medium-sized pan at medium-high heat. When the solid becomes a liquid, toss in the popcorn kernels. Again, a non-stick pan works best for making popcorn. When the popping sound start to fade to approximately 5-10 seconds apart, pour the popcorn in a large paper bag and shake the bag around a bit to release any excess oil. I used the bags they give you at the grocery store. Spread the popped popcorn out on either a roasting pan or 13″ x 9″ baking pan, basically something that has sides to hold everything in. Set this aside. In a medium-sized saucepan (you’ll want a larger pan because the carmel foams up when it cooks) begin melting the butter. 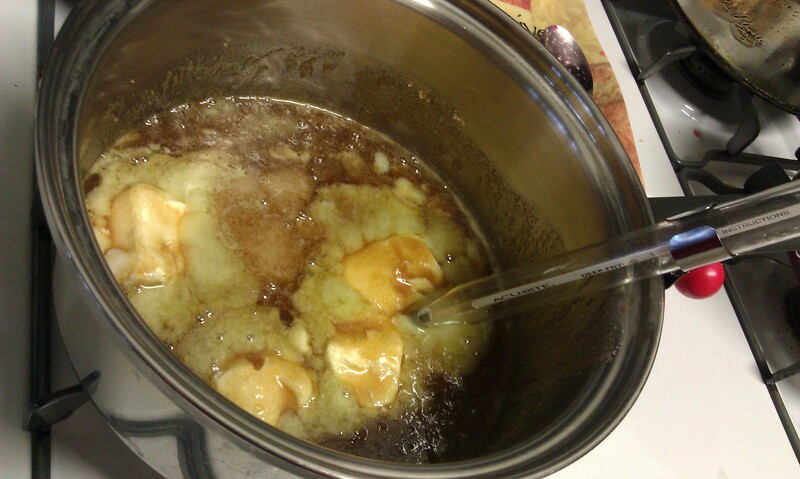 Stir in the salt, brown sugar, corn syrup, baking soda and maple syrup (use only real maple sugar, not Aunt Jemima’s). 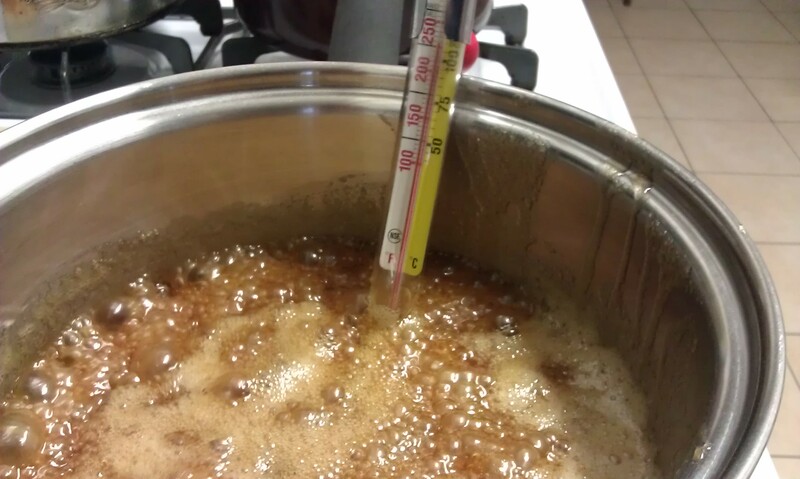 Keep stirring until everything is thoroughly combined, then place the candy thermometer on the side of the pan. You want it sitting in the liquid without allowing it to touch the bottom. Let this heat, without stirring, until the thermometer reads 235 degrees Farenheit or the soft ball stage. In the meantime, preheat the oven to 250 degrees Farenheit. Immediately pour your carmel sauce over the popcorn, attempting to cover it all (you will have a chance to cover everything as it cooks in the oven). Place the popcorn in the oven for an hour, intermittently flipping over the popcorn with a spatula every 10-15 minutes until all of the remaining carmel sauce on the bottom of the pan is coating the popcorn. 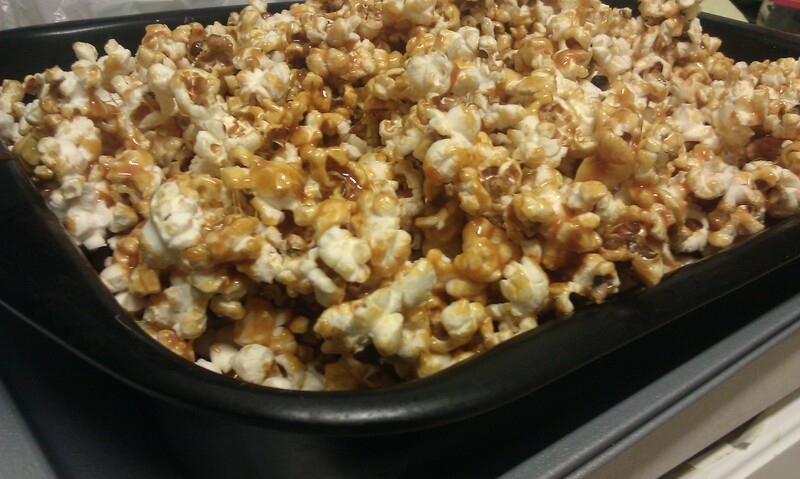 I took my spatula, scraped the bottom, then flipped the sticky mess of carmel back over the popcorn. When the popcorn seems complete, immediately set the popcorn onto a cookie cooling rack, separating the large clumps as you go. 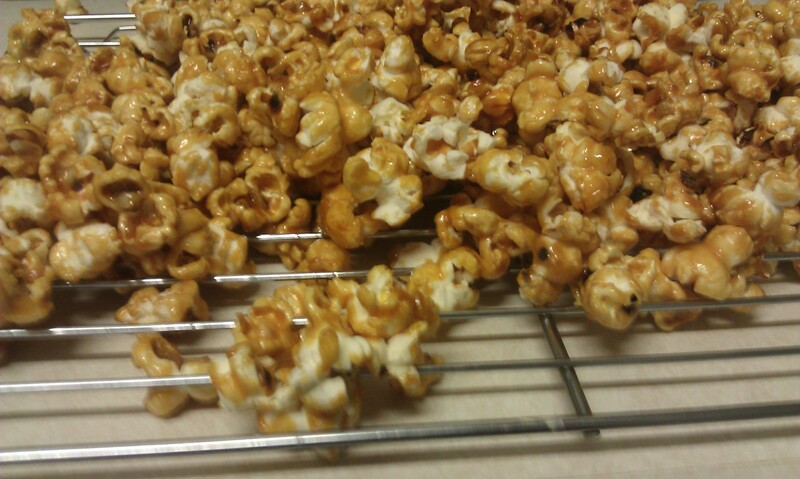 If you wait too long, the carmel will start to harden, causing the popcorn to stick fast to your pan. If this happens, just toss the pan back into the oven for 5 minutes and try again. If you are combining the cheese and carmel popcorn, toss them together in a large container or another paper bag and shake until they disperse evenly. The carmel popcorn will last in your household for a week or two. It has a sticky quality, but melts in your mouth unlike the store-bought kind. The more carmel sauce the better, in my opinion, coat the pieces until they’re dripping. The best part of making it from scratch is, if you aren’t like me, and like your carmel sauce lightly sprinkled on top of the popcorn, you can create it to your preference. Mixing both the carmel and cheese popcorn allowed for a salty sweet mix most people enjoy (think pretzel M & M’s or trail mix). The added cayenne really spiced up the mix, and was almost impossible to stop eating without having someone else pull the treat right out from your hands. I chose to mix the two together in the bag I mixed the cheese popcorn in, then some of the remaining seasoning stuck to the carmel. Delicious. It was also a great substitute to passing out cookies or chocolate for Christmas. I took a bit of a break to collect myself for the holidays. I’m back and have prepared quite a few dishes to share over the next few days. I try to make a Christmas craft every year to pass out to work, family, or friends. 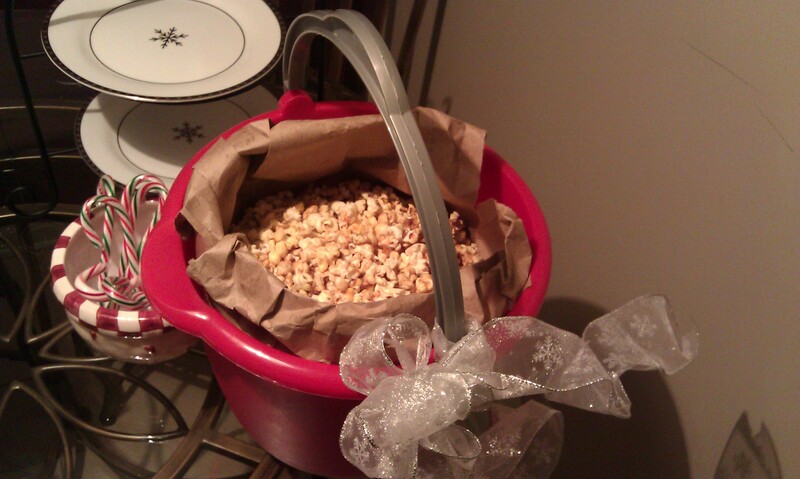 This year I attempted several knock-off Garrett’s popcorn recipes adding a few other ingredients to spice up the mix. 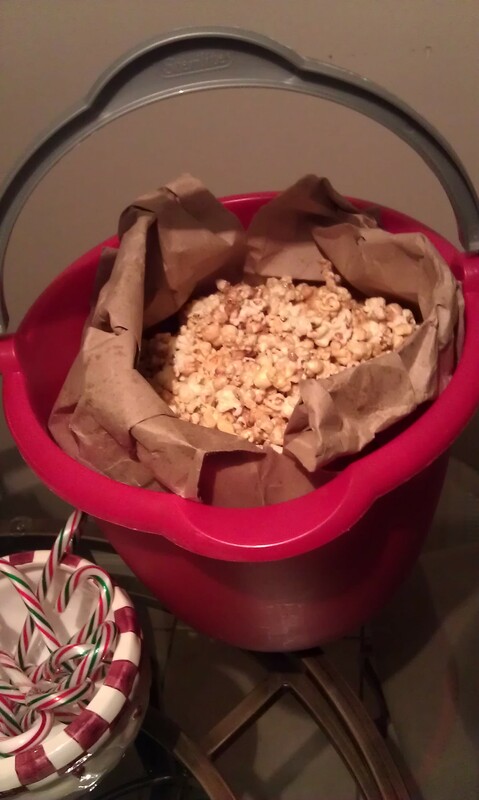 If you have never made homemade popcorn from the pan, you are in for a treat. Start by heating the two oils until the solid coconut oil melts in a medium-sized saucepan. I attempted this in a soup stock pot, but the pan doesn’t heat properly ending up with half a cup of browned kernels and quite a few burnt popped pieces. Also, I pulled out my non-stick pots from college as the stainless steel pots my mom swears by kept burning the popped pieces. If you are cooking for someone with an allergy to coconut, substitute in olive oil. 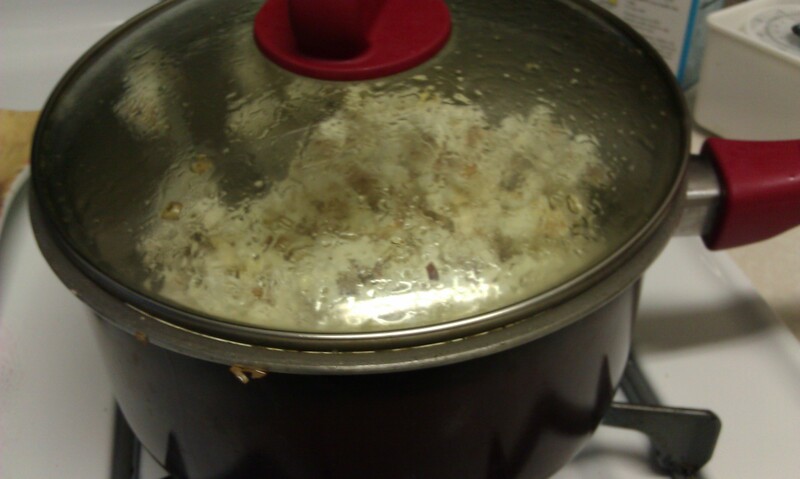 Add in the popcorn kernels to the heated oils and cover the pan. 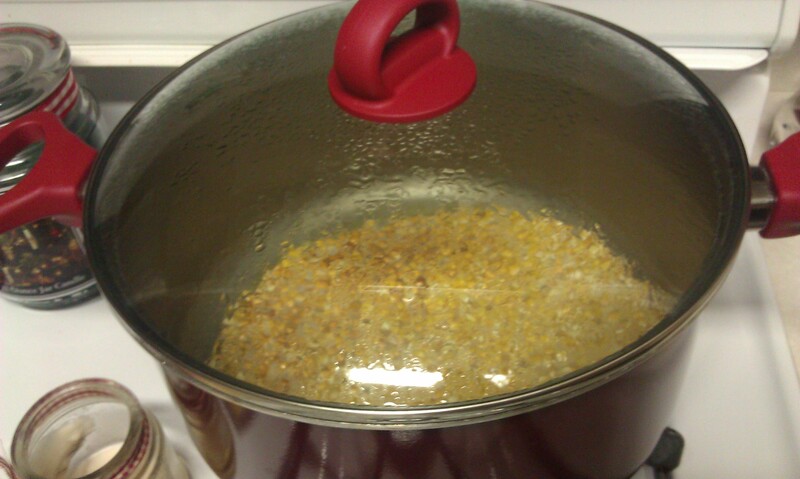 When the kernels start to pop, shake the pot every minute or so to get the unpopped kernels to the bottom. It also helps from scorching the popped popcorn pieces. As the popcorn fills the pan, you can shake half out into a large brown paper bag if the popcorn starts to push open the cover on the pan. 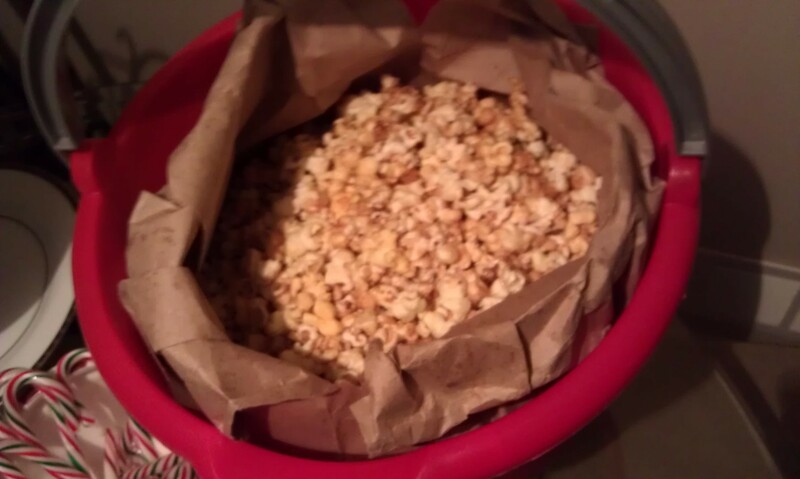 Continue popping the kernels until the popping slows to 5-10 seconds apart. 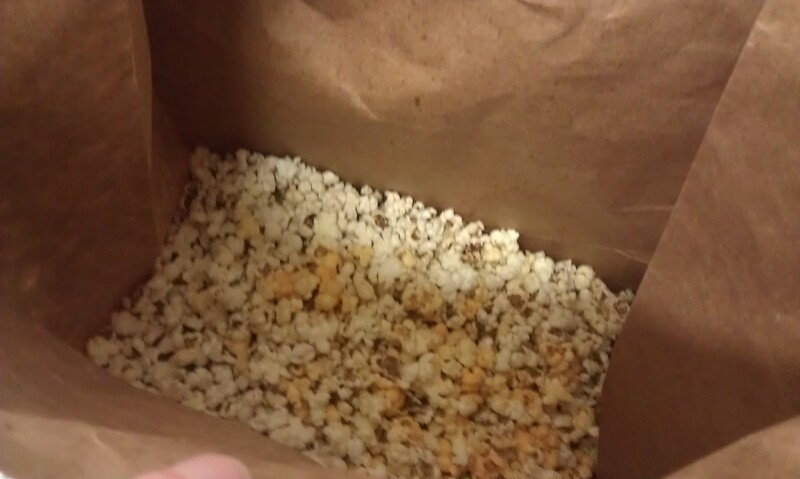 Toss the remaining popcorn in the brown paper bag. Add in the powdered cheese, ground mustard, garlic salt and cayenne. Close the paper bag and shake around. 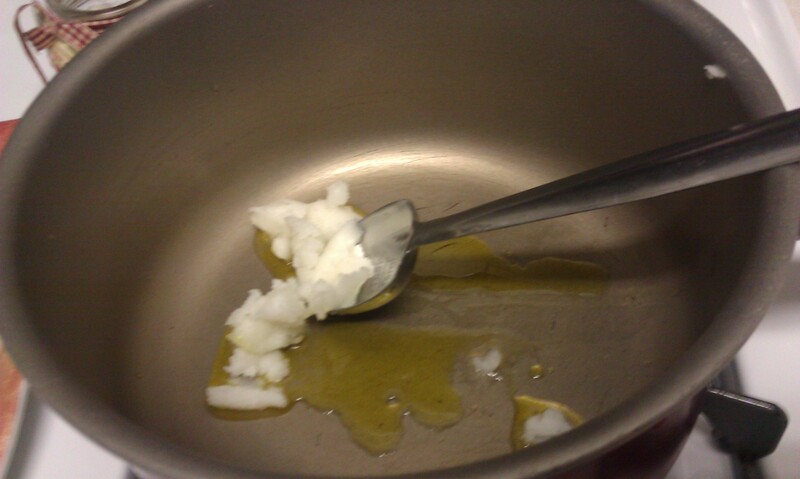 Sprinkle in a few drops of the buttery popping oil as desired to catch more of the seasoning. The popcorn has a great spicy kick to it, but unlike Garrett’s Cheese, it doesn’t quite coat every morsel of the kernel leaving a greasy orange residue on your hands. Instead there’s a light, salty, cheesy taste. I popped these into holiday inspired paper bags, layered caramel corn on top (or mixed them together) and passed them out to everyone I ran into over the holidays. On my way to our Christmas Eve destination I made the mistake of keeping the bucket of popcorn in my lap during the 45 minute drive. It was very hard to stop eating once I started, which several of my friends also admitted to not being able to stop eating it. It’s a healthier version of the usual array of holiday chocolates, cookies, cakes and sweets that we overload on.